When adjusted for inflation, games have maintained a steady cost over the decades, but that doesn’t account for collector’s items. A pristine copy of the original Super Mario Bros. just sold for over $100,000 in what industry experts are calling one of the biggest sales of all time. The classic Nintendo Entertainment System game sold for $100,150 earlier this month in a private transaction. 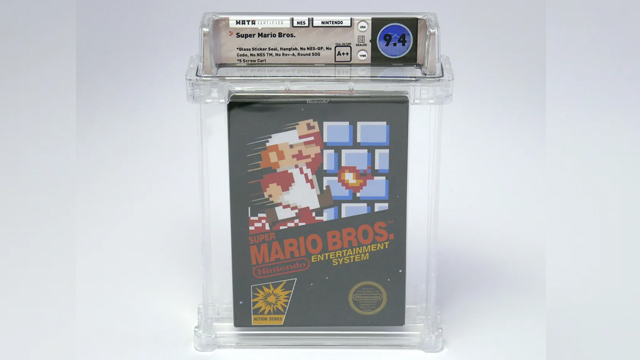 This wasn’t just any old copy of the game, however, as the six-figure deal was closed for a first-run, pristine conditioned box of Super Mario Bros. It is being speculated that this is perhaps for the first ever sale of this high dollar value in the vintage game collection business. The sold copy included the extremely rare first run sticker which indicates that this particular copy of the game was part of the initial rollout of Nintendo titles for the American market. The quality of this copy was also of note due to the original runs not being shrinkwrapped at the time, a production choice which has made the collection of a pristine copy of such titles quite difficult. The exorbitant price becomes somewhat more palatable given that it was split between three different buyers, all of whom will now share the precious game in a situation reminiscent of a scene from The Simpsons. The three new owners, Rich Lecce, Zac Gieg, and Jim Halperin are each related in some way to video game collection and preservation efforts. Halperin, in particular, is the founder of a collectibles auction company called Heritage Auctions. The buyers are in good company, as many other rare Nintendo titles have also been sold for large sums of money in the past. According to Kotaku, this sale is a massive jump above the previously recorded transaction for Super Mario Bros. back in 2017, which sold for approximately $30,000. The NES Bandai game Stadium Events sold on eBay for a staggering $41,300, while other titles on the system have gone for anywhere between $10,000 to $50,000. Tags: Mario, nes, nintendo, Nintendo Entertainment System, Super Mario Bros.